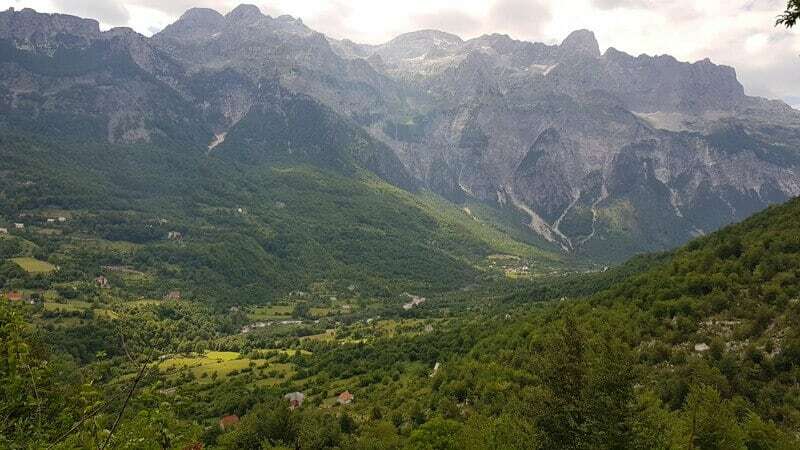 We got a sneak peek at the magnificent Albanian Alps in Peja in Kosovo when we drove through a gorge alongside the Lumbardh river into the “Accursed Mountains”. Don’t you love that name? 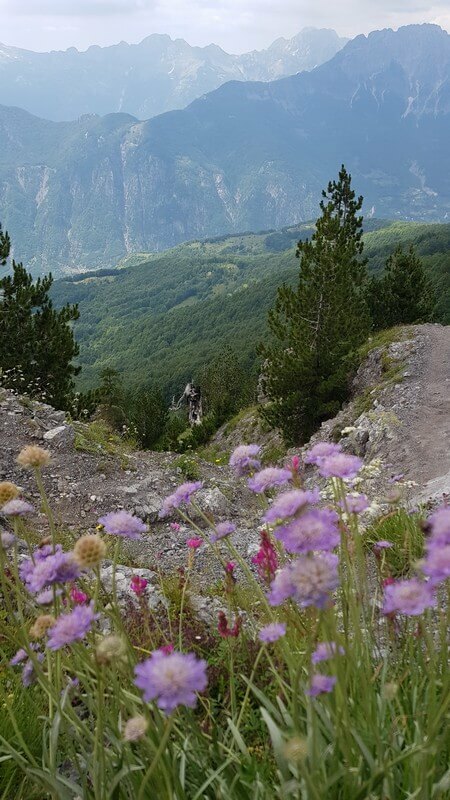 It conjures up magic and spells and the beauty of these mountains are just that…spellbinding! 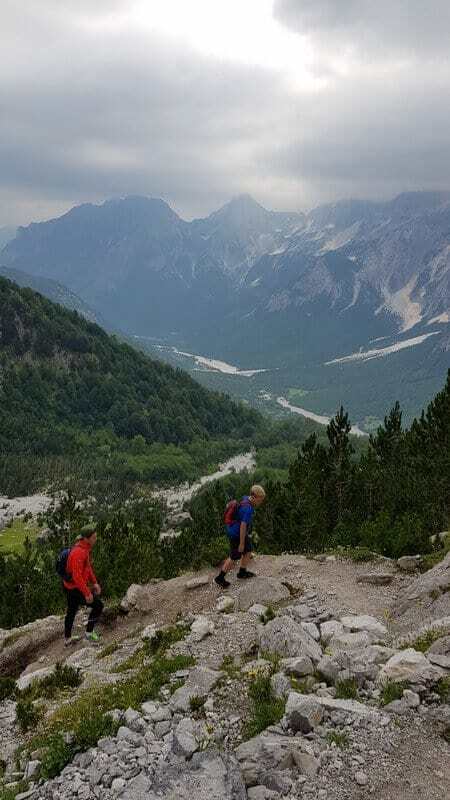 Now that we were in Albania, I couldn’t wait to spend some time in these amazing mountains and the Valbone to Thethi hike sounded like the perfect way to achieve this. 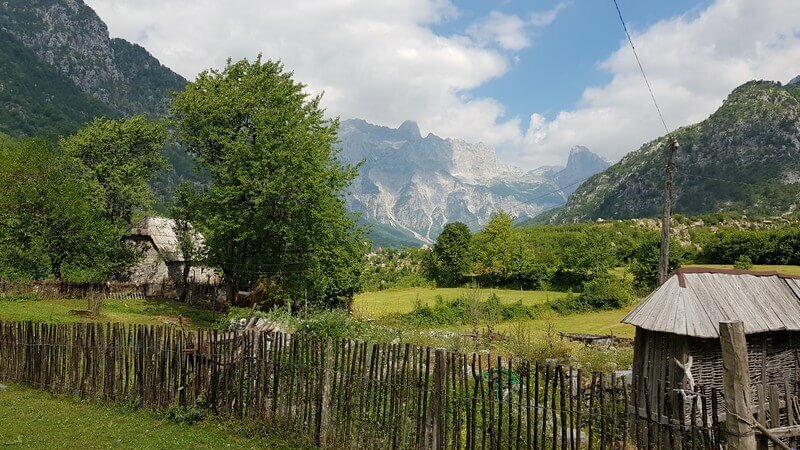 The Valbone to Thethi trail is an old mule trail traversing the Albanian Alps with simply spectacular views of the craggy mountains dotted with patches of glacial ice. 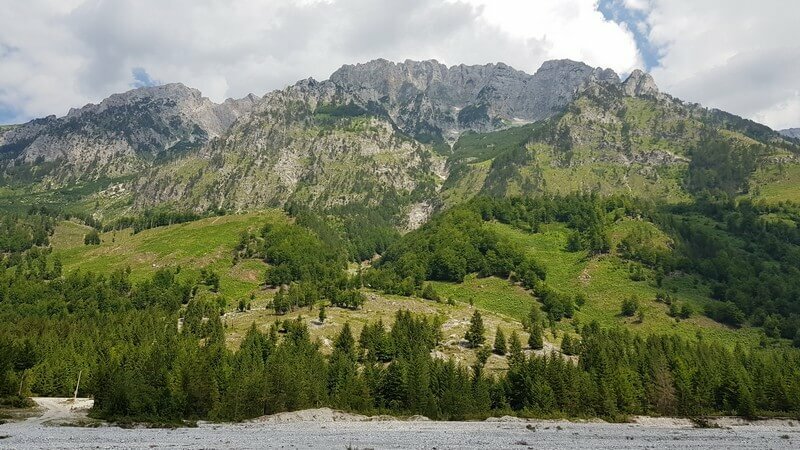 Starting in the village of Valbone, the trail takes you over the Valbone Pass at an estimated 1600m and down into the picturesque village of Thethi on the other side. 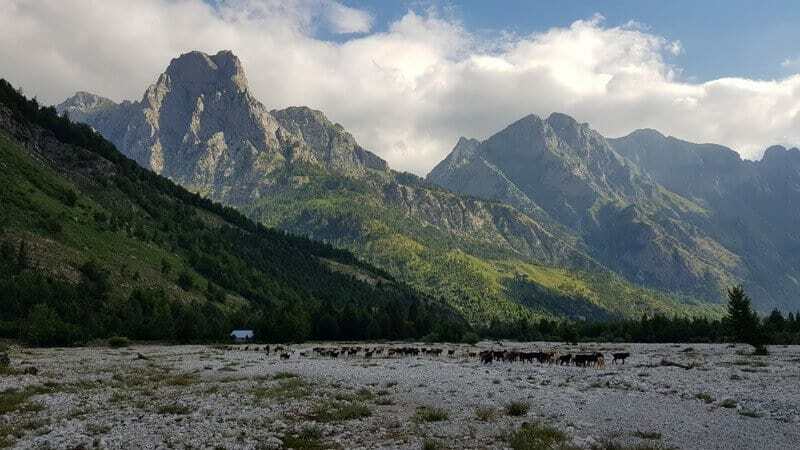 The Valbone to Thethi hike actually forms part of a 200km long trekking ring called the “Peaks of the Balkans”, which takes you through the Accursed Mountains in Albania, Montenegro, and Kosovo. I love hiking, but 200km, now that would be an impressive feat! The next question was HOW to do it? Could we drive our campervan to Thethi? ABSOLUTELY NOT! We have driven on some fairly shocking roads the last few months, but the road to Thethi is a whole different beast. You absolutely need 4×4, don’t even attempt it if you don’t. It’s a bumpy gravel serpentine road with a ridiculously steep gradient and a sheer drop down the side into the valley. The road is basically one lane and I still don’t know how cars found the space to pass each other. So no, please do not attempt this in a campervan. If you have a really small car or a 4×4 Combi type camper, then you could, but you’ll need nerves of steel! Could we drive our campervan to Valbone? 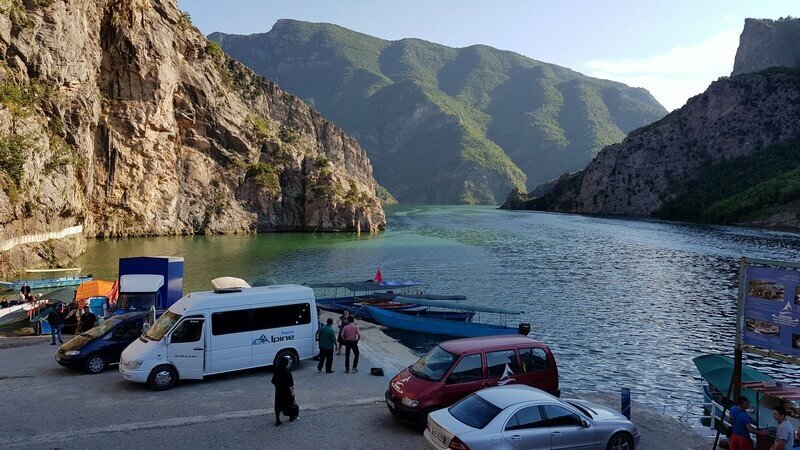 Yes, it is possible to take a car to Valbone, but you will need to put your vehicle on the Lake Komani ferry. The ferry is really small and only accommodates 3-4 cars, so you’ll have to book in advance for a spot. 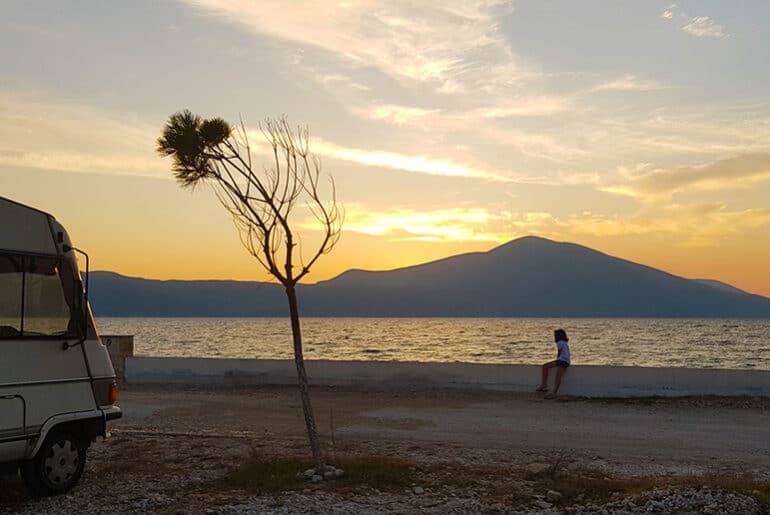 The road from Shkoder to Lake Komani is terrible but do-able, so give yourself ample time to navigate the potholes. 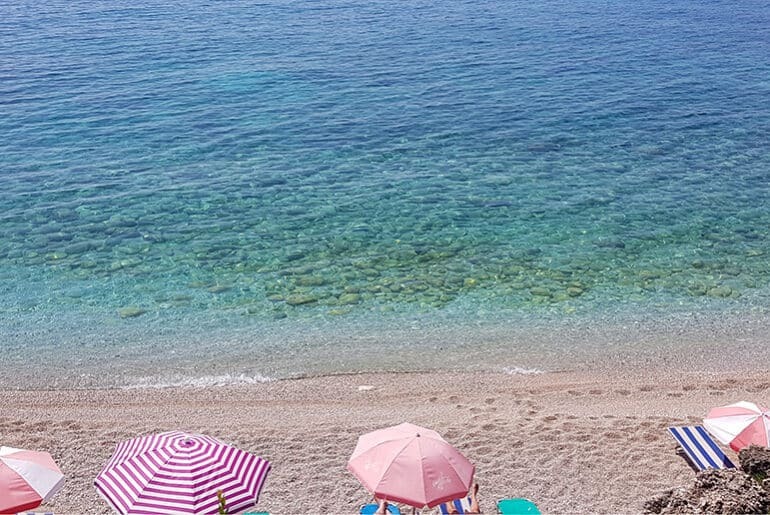 The roads from Fierza to Valbone are excellent, so once you are here it will be plain-sailing. 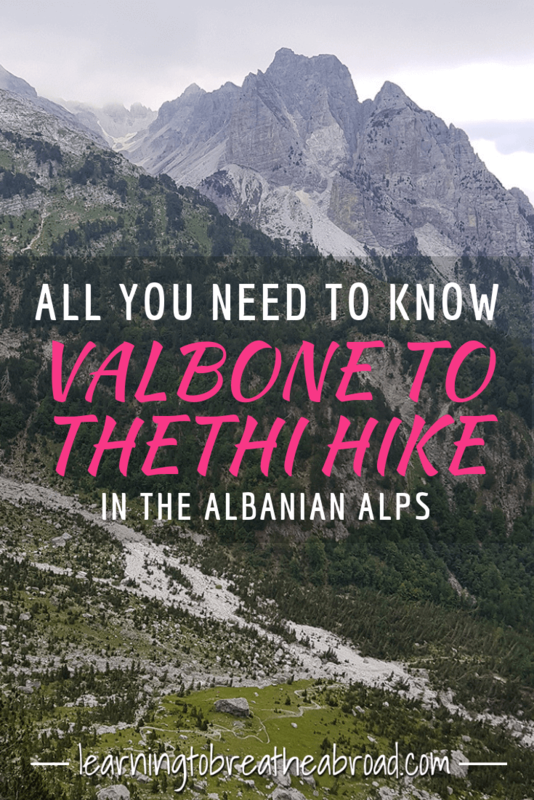 It is very Important to note is there is no way to get from Valbone to Thethi other than hiking over the mountain. 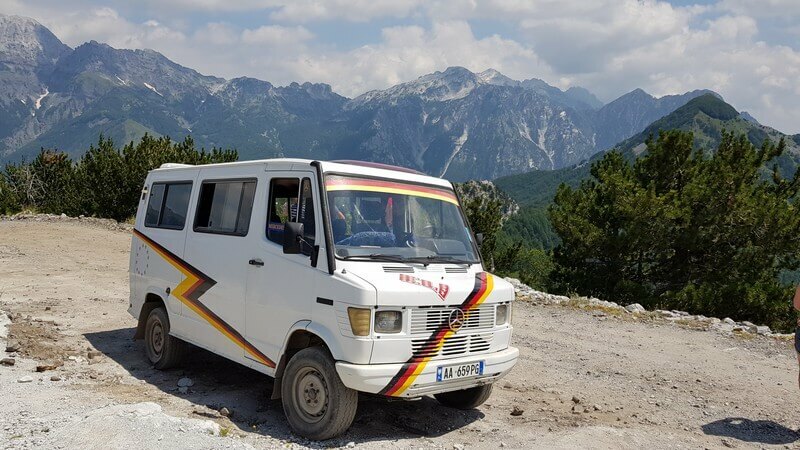 If we took our campervan to Valbone, then we would have to return the same way to get back down to the Albanian coast. So with a self-drive out the question what were our options? 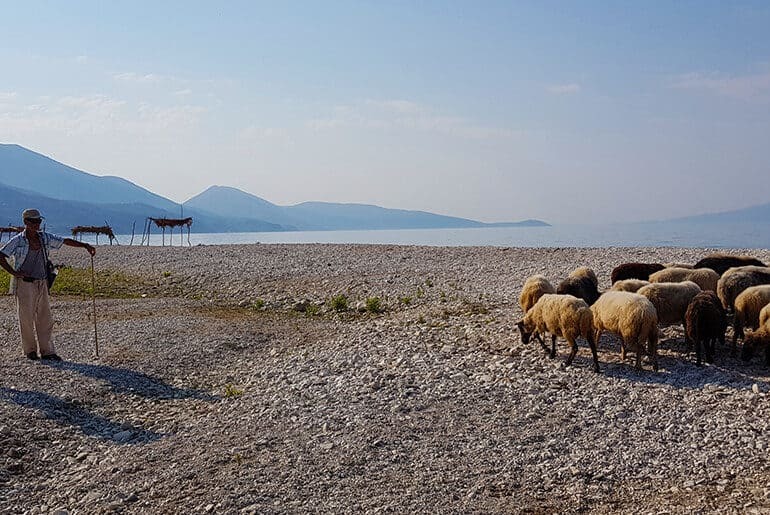 We were staying at what could possibly be the best campsite in the Balkans – Lake Shkodra Resort. 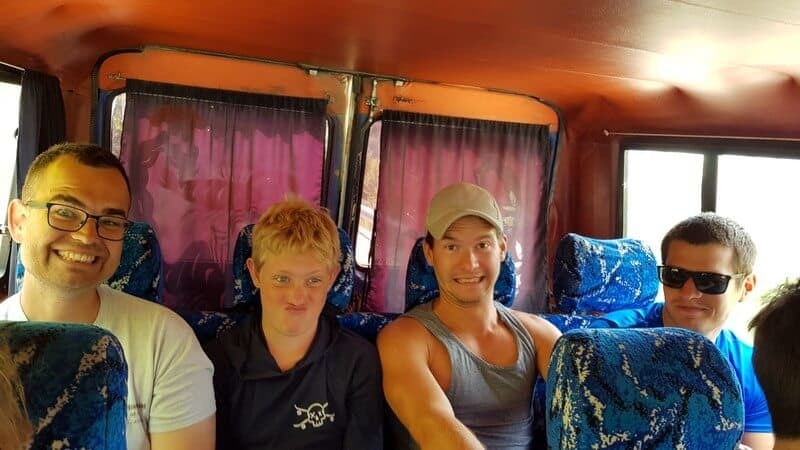 They offered the following all-inclusive tour which included all the transport, all meals and a guide for the hike for 150 Euro per person or 125 Euro if there were more than two people. An added bonus is that we could leave our campervan at the resort for free while we did the tour. After being the sole driver, navigator and trip planner for the last few months, I decided to splurge on the tour and let someone else handle all the details. 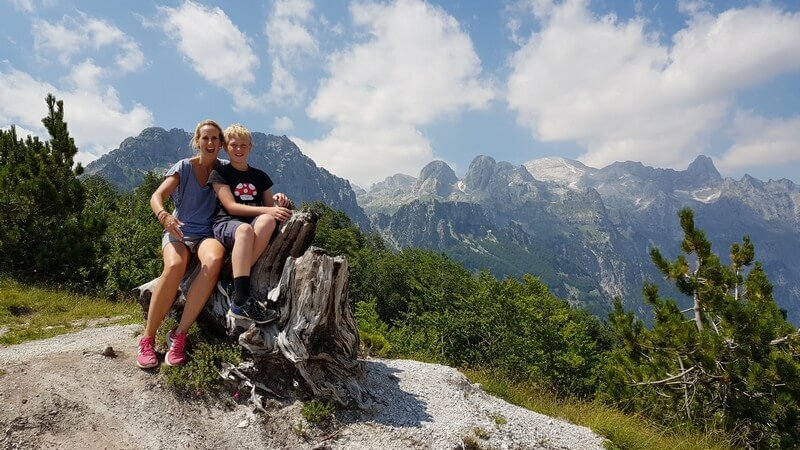 It was one of the best decisions I think I’ve made and the hike has to be one of the top 5 highlights of our trip through the Balkans so far. 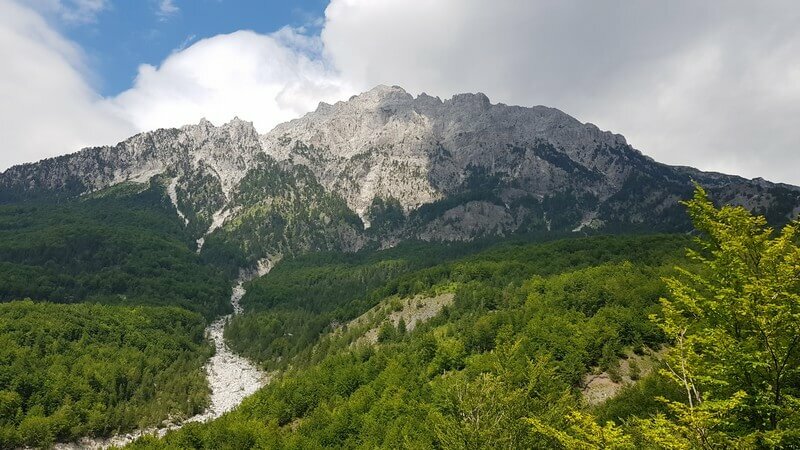 The Valbone to Thethi hike is an absolute must for anyone coming to Albania. 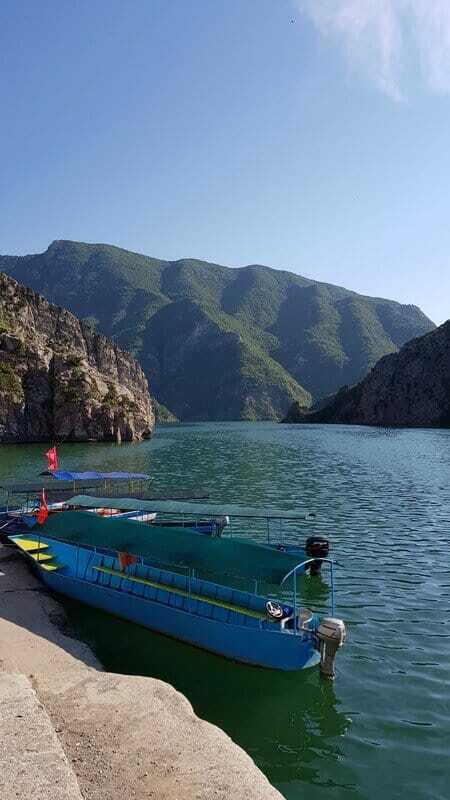 We were collected from Lake Shkodra Resort at 5.45am. A rather early start but we needed to catch the 9 am ferry at Lake Komani. We had only just started heading into the hills behind Shkoder when the roads started rapidly deteriorating. I was ever so thankful not to be navigating the potholes and dirt tracks and was loving every minute of sitting back and enjoying the scenic ride. The last 500m was through a small, dark, single-lane tunnel, with a traffic light managing the traffic. The traffic light was red when we arrived, but our driver barely braked and continued into the tunnel with not a worry in the world. Luckily we only met one oncoming car and a small one at that, so we managed to squeeze past each other. 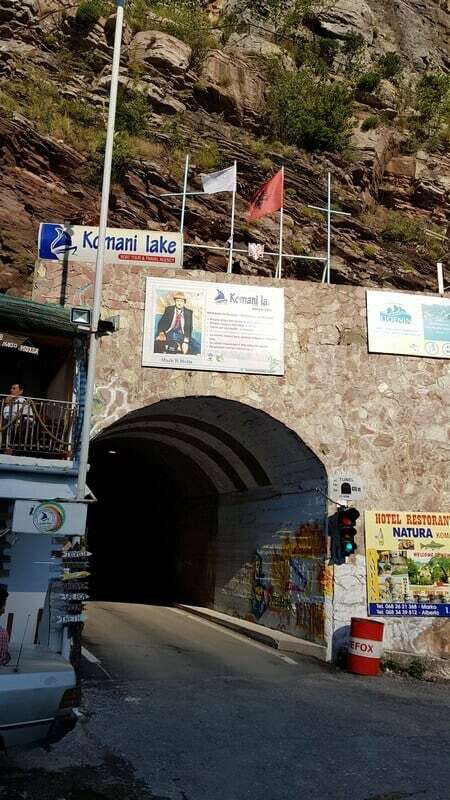 On the other side of the tunnel was a rather small cement jetty, a restaurant and tour agency, and the stunning Lake Komani. We had some time before the ferry arrived and after our early start, coffees were the order of the day. 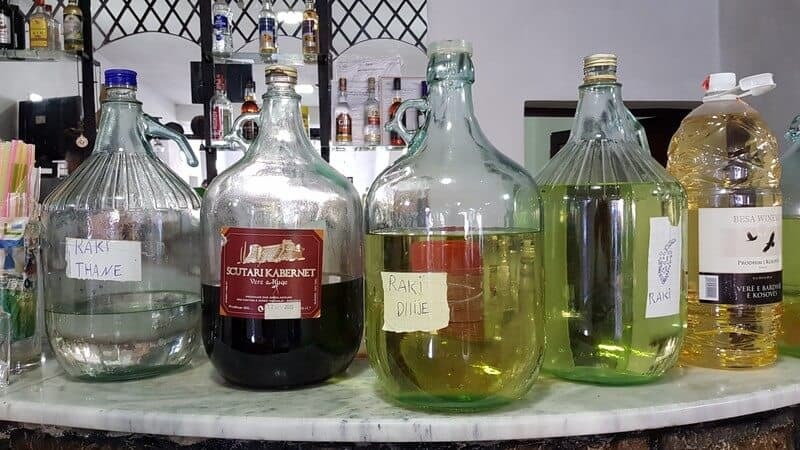 A barbeque was on the go with cepvaci and chicken being grilled and on the counter inside was a vast array of home-brewed rakija. There was a festive air and everyone was excitedly waiting for the ferry. 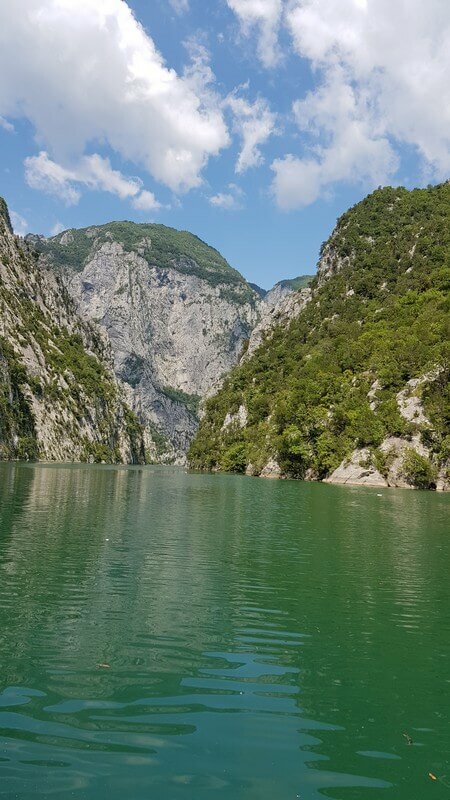 There were 8 of us in our group from Lake Shkodra Resort – three Hungarian guys, three Belgian girls, Tai and myself. While waiting for the ferry we all got chatting and I realised we had scored gold, as they were all too divine! I could see us having lots of fun over the next 48 hours. At the appointed hour, a few smaller ferries arrived, but there was still no sign of the big ferry. Luckily one of our new found traveling companions was told that the big ferry wasn’t coming so we had better jump on a smaller ferry, which we did. For 3 hours we slowly puttered through the steep gorge carved by the river over thousands of years. We passed villages and lone churches that looked impossible to reach by car, yet so high on the hillside that it would be a serious hike up from the river. Despite the remoteness, there was lots of cultivated land with vineyards and orchards. 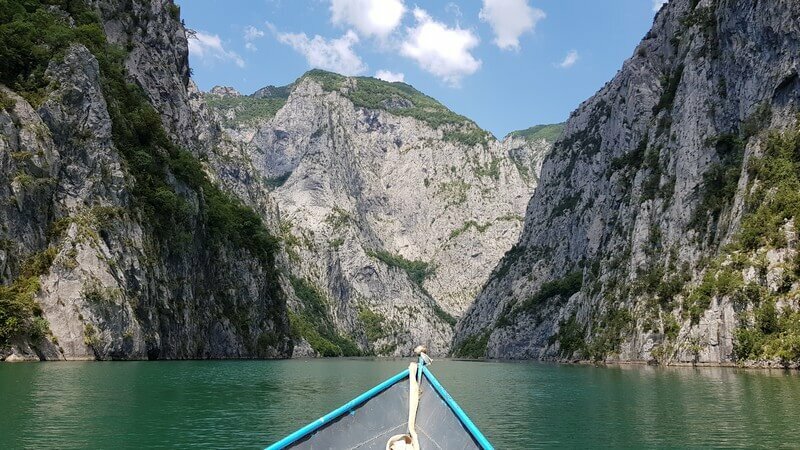 The scenery on Lake Komani is very spectacular, with dramatic karst mountains plunging deep down into the emerald green water of the Lake. Sadly there was a stretch with lots of plastic bottles floating on the water, which was such a shame on an otherwise pristine journey. Arriving at the port of Fierze, we were met by minivans which took us the last stretch to our guesthouse in Valbone. The roads here were fantastic and we arrived in Valbone in an easy 1.5hrs. The guesthouse was surprisingly big with accommodation for 20 people and a few other groups were already there. 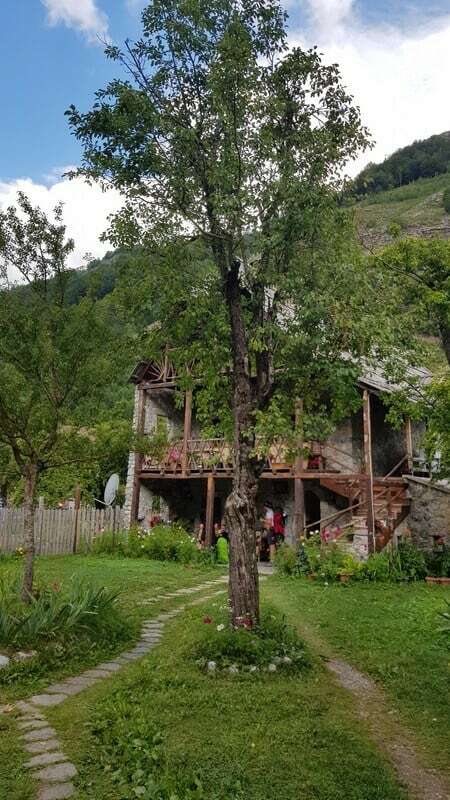 We arrived just after 1 pm and were served the most delicious traditional Albanian lunch of a baked spinach and rice dish with a fried egg on top, roasted peppers, grilled aubergine and home baked bread. After an early morning and a long trip, it was time for a little rest and relaxation before dinner. Dinner was a festive affair with groups from Sweden, Australia, Germany and our gang of 8. I’m not even sure what everything was called, but the food was incredibly delicious. Roasted aubergines with yoghurt or tomatoes, stuffed peppers, feta cheese, local cream, tomato and cucumber salad, pickles, fried aubergines, roasted goat meat and more. We went to bed with full tummies and great excitement for the next day’s hike. Breakfast was fritters with homemade jam and feta cheese. This was accompanied by Turkish coffee and mountain tea, which was full of delicious local plants and herbs. We were then given big bowls of fruit, tomatoes, cucumbers, cheese, cold meat and bread with which to make sandwiches to eat en-route. We set off at 8.30am accompanied by our young (he was only 17) guide, whose father owned the guesthouse. The first few kilometers were on an asphalt road, but I guess your start would depend on where you stayed. The official start is at the village of Rragami, but you will need a 4×4 to drive you up the dry riverbed. Your guesthouse may drop you at the end of the asphalt road, or like us, you’ll start from your guesthouse. At the end of the asphalt road, the terrain changed and for the next hour we followed the 4×4 tracks through the white stones of the dry riverbed, the mountains getting closer with every step. 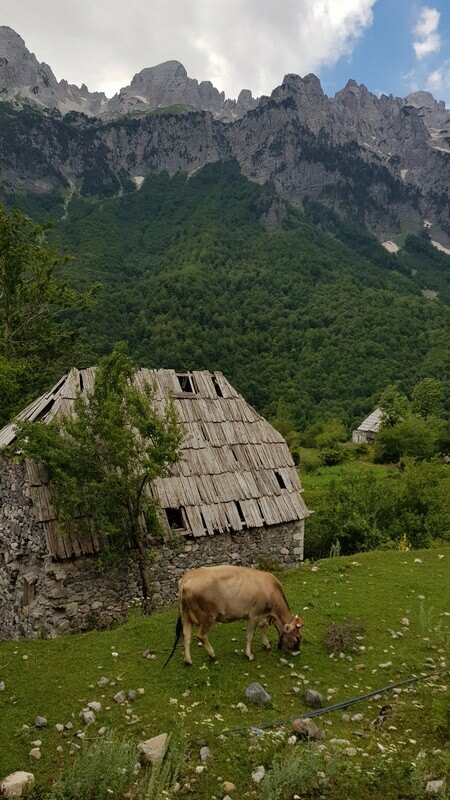 At the village of Rragomi, we were so busy looking at the traditional stone houses, that we almost missed our guide taking a small path up to the right. The trail is very easy to follow, but this point seems to confuse a lot of people, so if you don’t have a guide, keep your eyes peeled for the signs when you reach the stone house. From Rragomi to the top of the pass is an altitude difference of 764m. Up until now, the trail had been a gentle incline, but now it went up and I mean really UP! It suddenly got steep and the going was tough up the zig-zagging path. There was even a moment where Tai lay down and flat out refused to go any further. 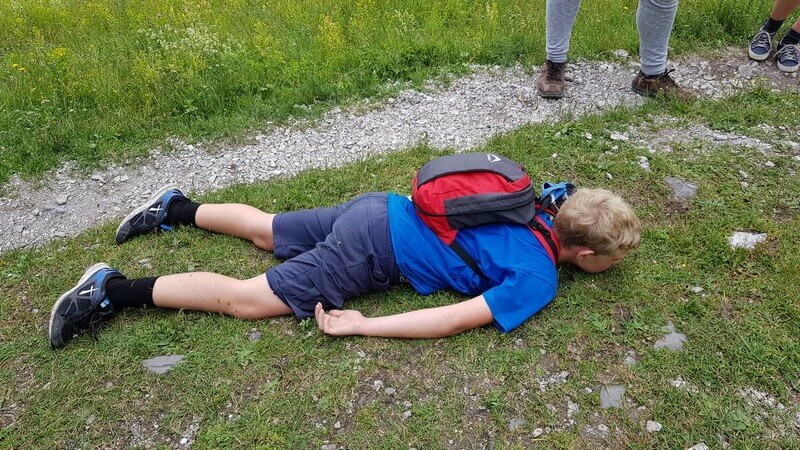 A promise of an energy drink at the next stop gave him a second wind and he scampered ahead of us all for the rest of the hike, thank goodness! We passed a number of hikers coming in the opposite direction, a lot of whom had hired horses to carry their backpacks over the mountain pass. I believe the cost for this was 50Euros and the horses are available for hire from Valbone and Thethi. 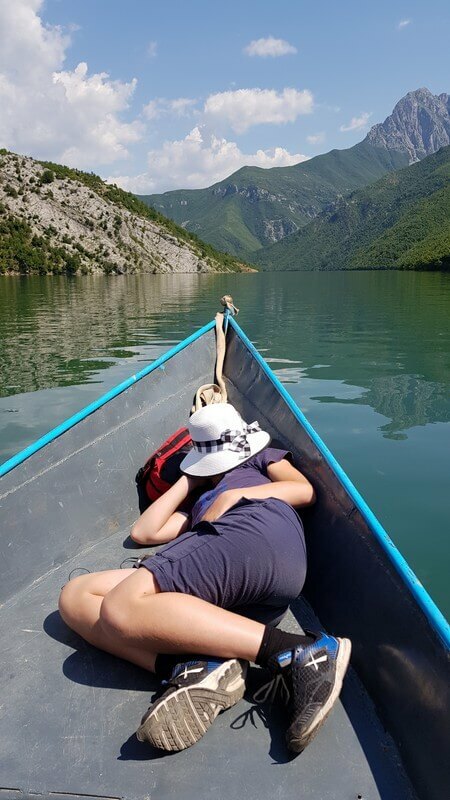 There is no road between Valbone and Thethi, so if you aren’t doing a looped trip you may need to take your luggage with you in this manner. 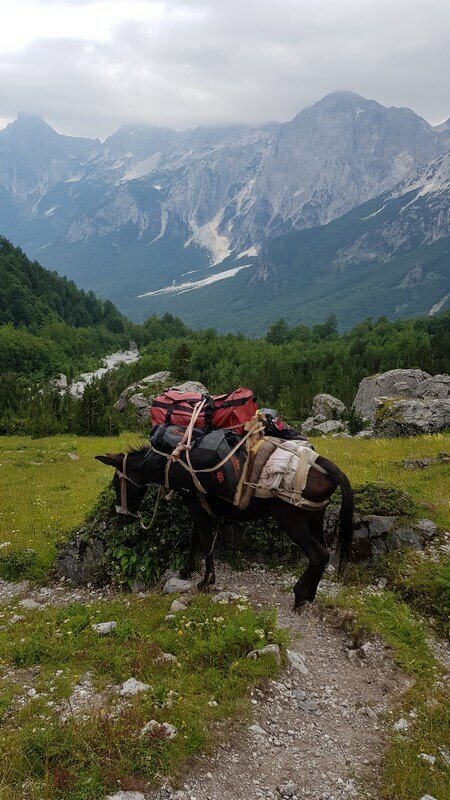 We also passed a man with two donkeys, heavily laden with empty cooldrink and beer cans from the mountain cafes. 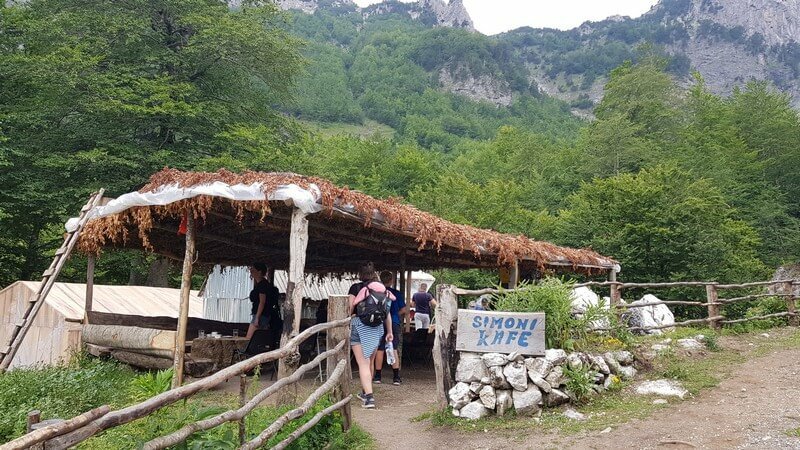 The Simoni Kafe was a welcome pitstop where we refueled on rajika and beer and refilled our water containers with delicious water from the spring. Then it was onwards and upwards with the steep ascent to the Valbone Pass. 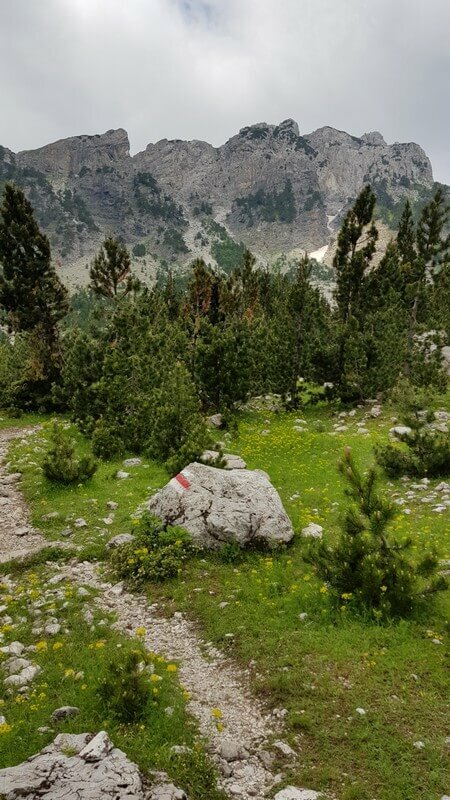 This stretch of the trail was above the tree line and the views of the Alps all around us was spectacular! Despite the heat, there were still large patches of glacial ice, shimmering in the deep crevices of the mountains. And suddenly we were at the top of the pass and the world lay below and all around us. 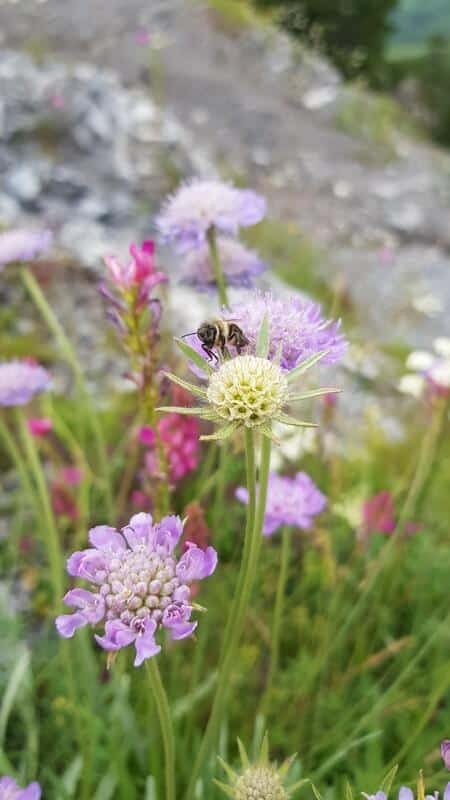 We were kings of the mountain, surrounded by a myriad of colourful spring flowers and the most breathtaking view! 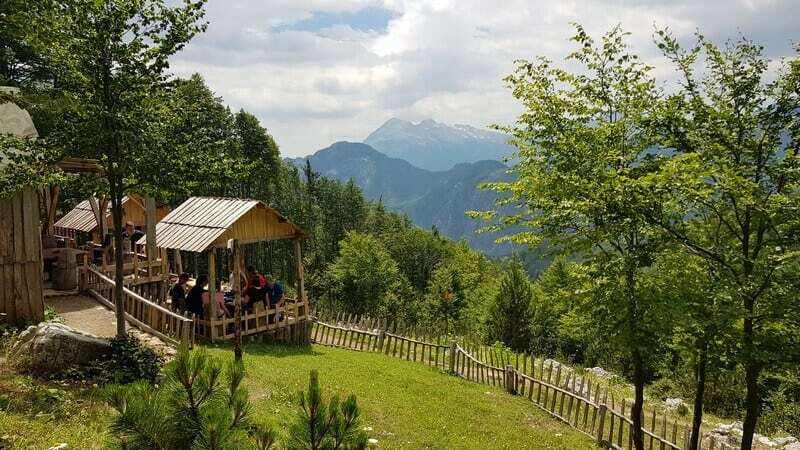 At the top of the pass you can leave your bags and do the optional extra hike up the ridge for magnificent views across both the Valbone and Thethi valleys. It will only take you a few more minutes to climb up and it’s well worth it for the dramatic views. Once you’re at the top, there is only one way to go and that is down, 1000m to the village of Thethi to be exact. 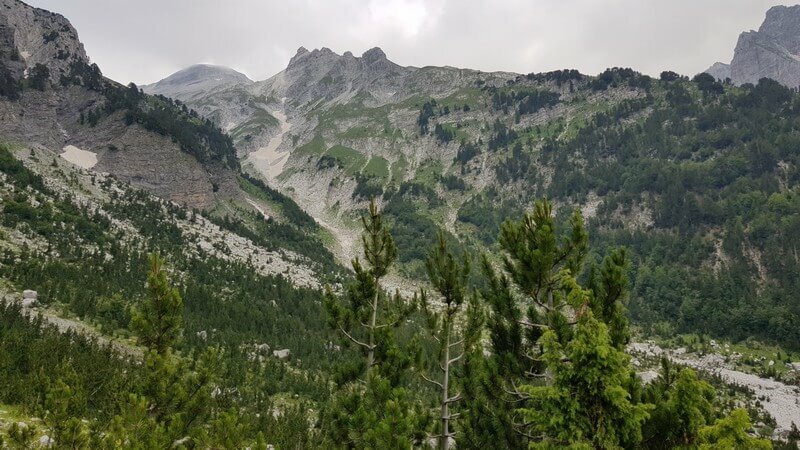 We soon found ourselves amongst a forest of trees with only an occasional opening with which to see the dramatic Alps. In my opinion, the best views are definitely on the Valbone side of the mountain. About 30 minutes down the trail, we came to the second mountain cafe. Everything in the cafe had been carved out of wood and was simply delightful. Our packed lunches were unwrapped and tucked into with more beers to wash it all down. After basking in the sun on the veranda for a while, we once again hit the road for the last leg of the hike. With legs feeling rather like jelly after the steep descent, we were overjoyed to see a minivan arrive at the end of the trail to take us the last few kilometers to our guesthouse. The guesthouse had a stunning view out over the Thethi valley and our hosts couldn’t have been more accommodating. Taking off my shoes and socks and having a long shower was blissful and the ice cold beer was just the cherry on top! Dinner was another feast of soup, grilled and baked aubergines, stuffed tomatoes, salad, cheeses, local yoghurts, fried chicken, ajvar, peppers, fergese and freshly baked bread. Even the most staunch meat eaters will fall in love with this mainly vegetarian traditional Albanian cuisine. Understandably, it was early to bed. 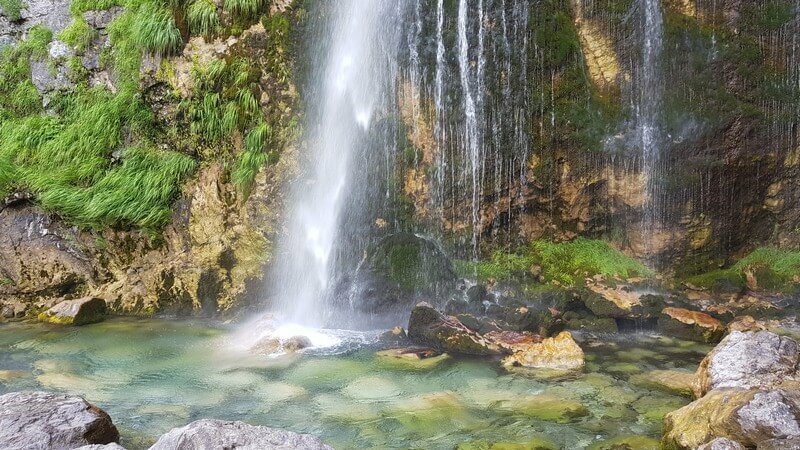 We were only being collected at 2 pm for our return trip to Lake Shkodra, so after breakfast, we set off for a shorter hike to the Grunas Waterfall. 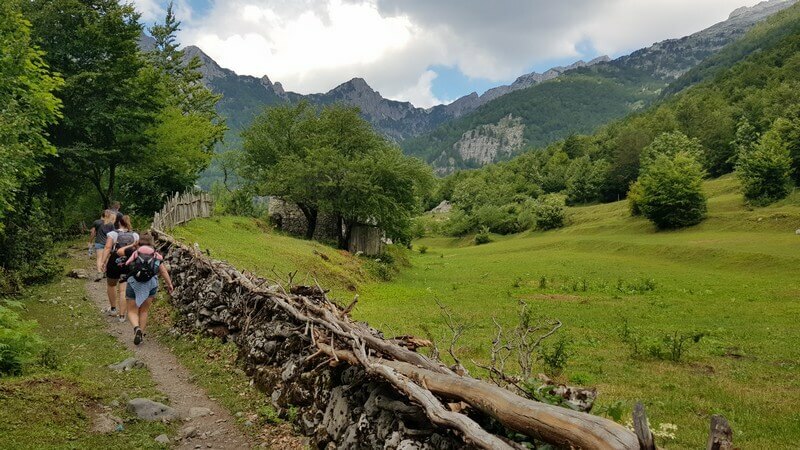 The path meandered through the village and alongside the river, then turned towards the mountains, passing old farmhouses. We took a few wrong turns but the walk was delightful and took us about 2hrs in total. Another feast was waiting for us when we got back to the guesthouse and shortly thereafter our minivan arrived to take us out of the Thethi Valley. And that’s when the fun really began! 13 of us piled into an old Mercedes 4×4 minivan with a driver extraordinaire! Smoking, talking on two cell phones at the same time and driving like a bat out of hell up the steepest gravel serpentine road I’ve ever been on, our driver showed what I can only refer to as remarkable skills. 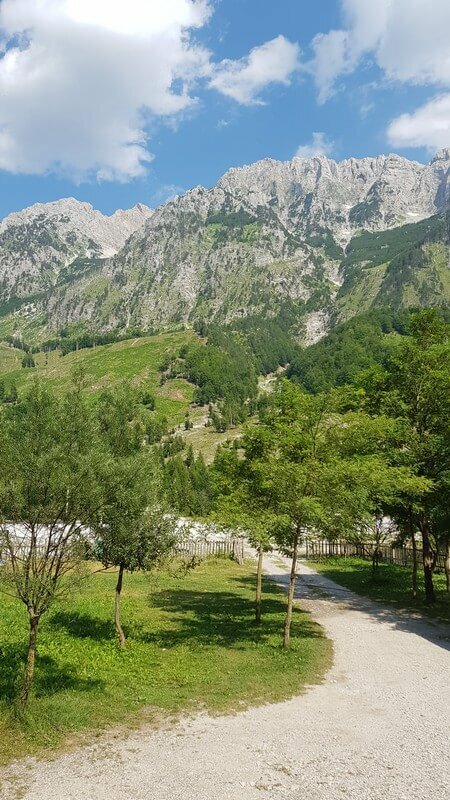 While we bounced and jostled in our seats, he calmly passed descending cars, with our tyres skidding mere inches away from a sheer drop down the mountain. My heart was in my mouth and nervous giggles floated around. He’d clearly done this drive innumerable times! At the top of the pass, the van stopped for a welcome break and a few moments to drink in the last views of this surreal landscape. Certainly nature at its best! And then we were off again down the other side. A much smoother ride this time with wonderful asphalt roads and another welcome break at a local cafe at the bottom of the valley. 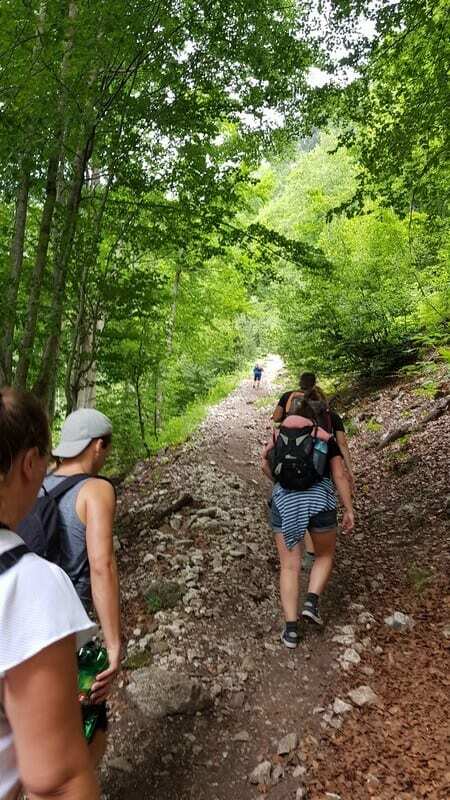 The thought of an 8-hour hike can be daunting and what if you’re not fit enough? I am by no means super fit. I walk a lot and do the odd bike ride, but I couldn’t run to the end of the road if I tried and I managed just fine. The trail may be steep in places, but the pace was slow and steady and we took breaks as and when we needed. 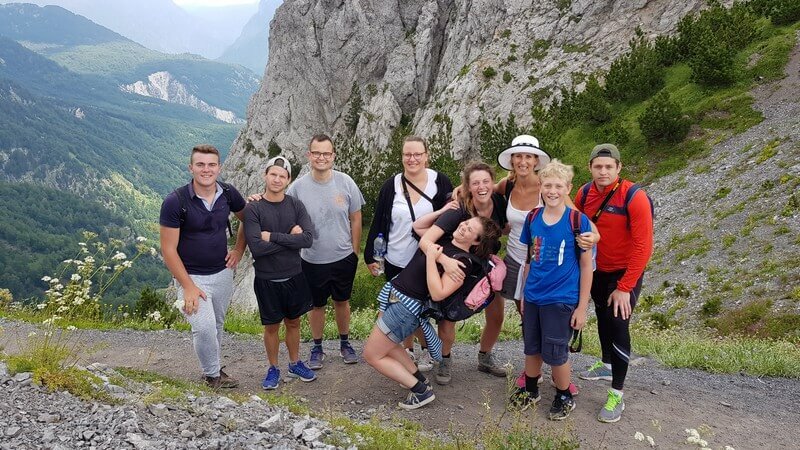 Some people do the hike in 5 hours – I couldn’t imagine that! We took 8 hours, enjoyed the view, stopped often to take photos and savored our beers and rajika while basking in the sun at the mountain cafes. What about kids? Will they manage the hike? At the age of 11, Tai managed it like a champion and probably could have done it from the age of 9 or 10. From a young age, Tai has joined me walking the dog and hiking on Table Mountain back home in Cape Town, South Africa. Whilst traveling he’s had to pound the sidewalks for hours while we sightsee, so he is an excellent walker. 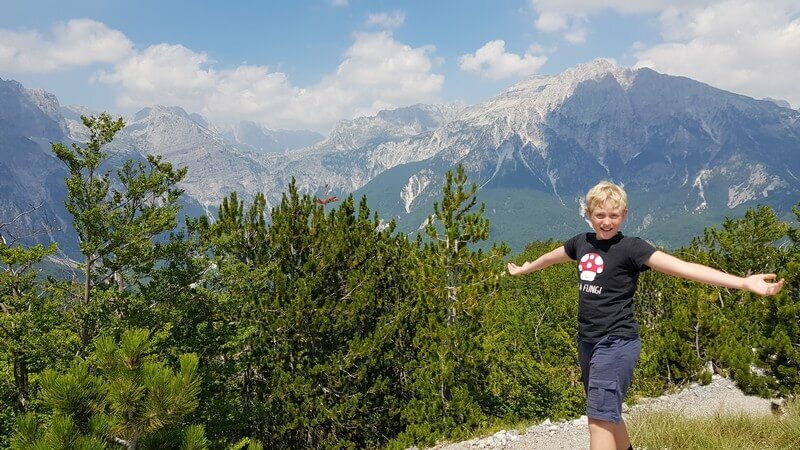 That being said, kids usually have boundless energy, so if you have kids around that ages of 10 and up, then they’ll definitely manage the hike. 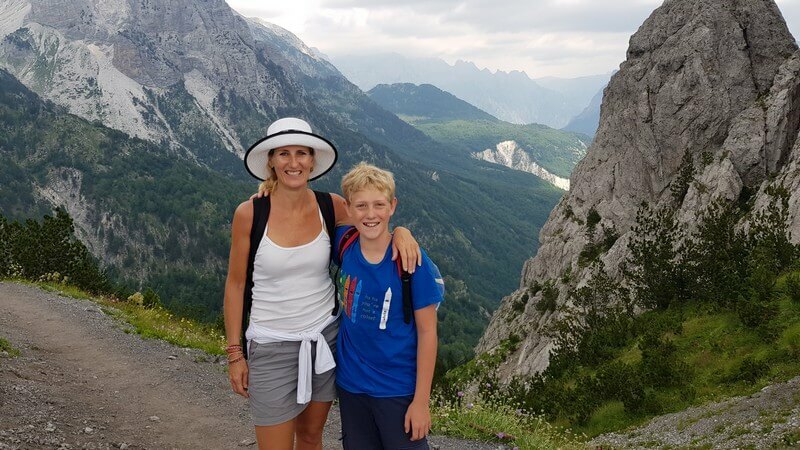 I think the Valbone to Thethi hike can be done by people of all fitness levels and from the age of 9 upwards. 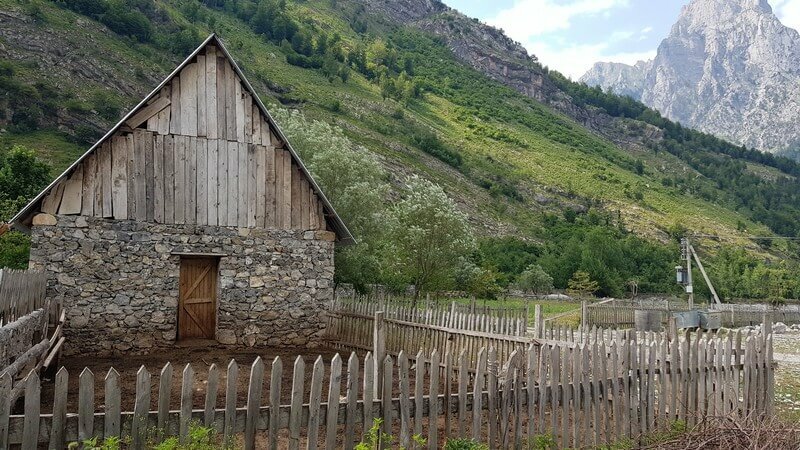 Being that Thethi is more remote and less accessible means it has retained more of a traditional village feel, but there is lots of construction happening so it won’t be long until this too changes. 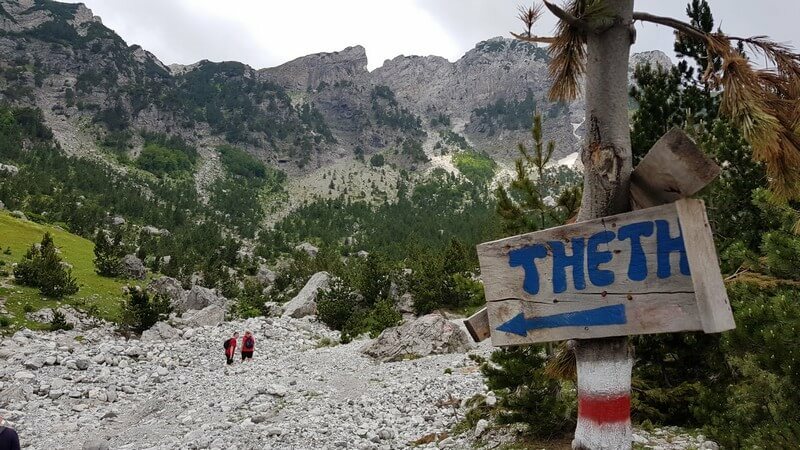 There are a few shorter hikes available in Thethi, namely to the 2hr (return) hike to the Grunas Waterfall and a 5hrs (return) hike to the Blue Eye. 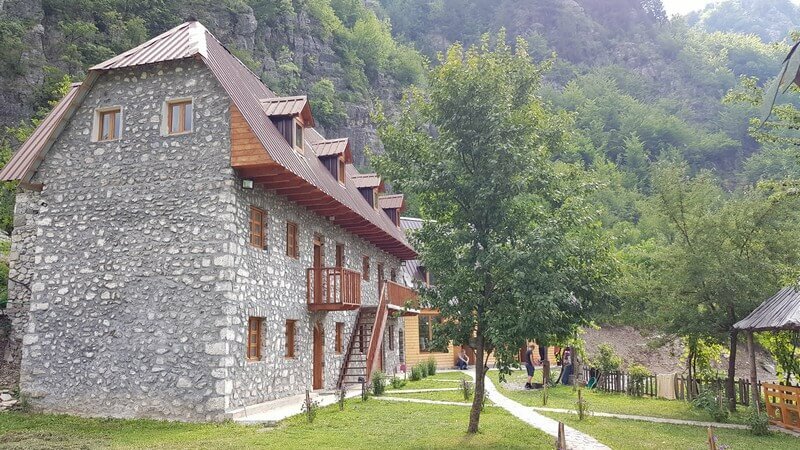 Some guesthouses will even drive you part of the way to the Blue Eye so your return hike is only 2hrs. This makes it do-able before the 1 pm departure time. 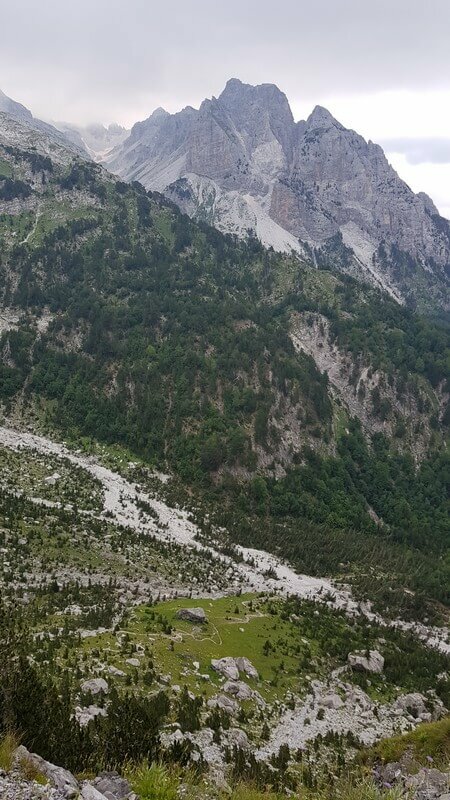 Although Valbone is a more developed village, the Alps make for a more dramatic scenery here than in Thethi. It would have been lovely to spend an extra day in both of these villages. 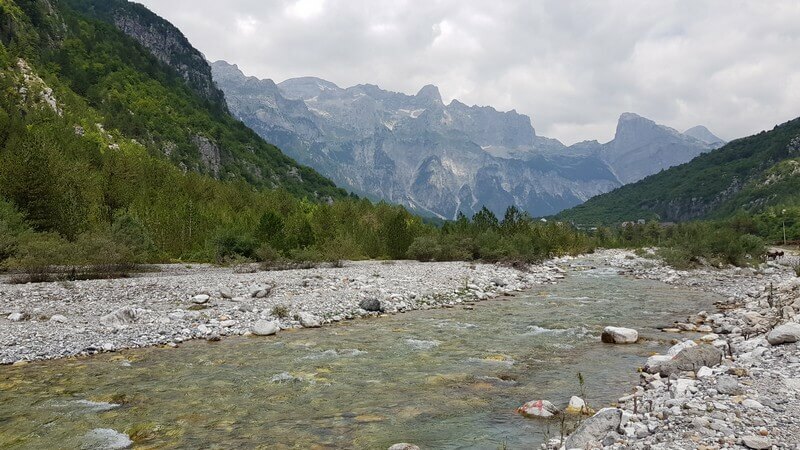 The Valbone to Thethi Hike was definitely one of the highlights of our 6-month trip through the Balkans and highly recommended to everyone passing through Northern Albania. We did the all-inclusive tour but met loads of people organizing each stage as they went. 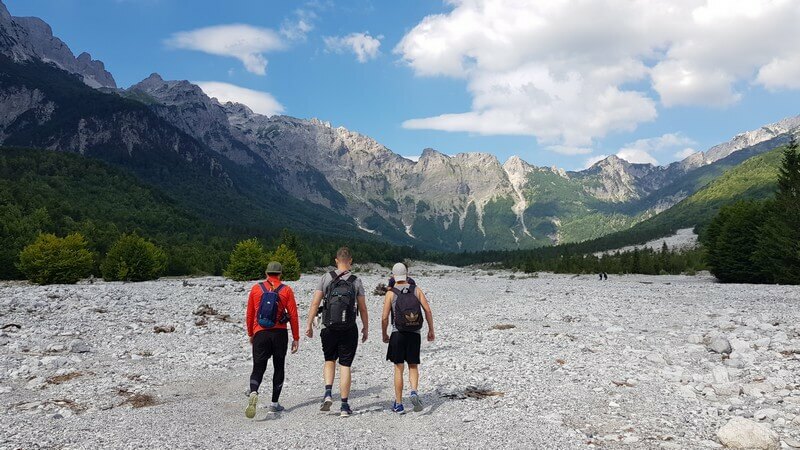 Personally, it was fabulous only having to worry about getting over the mountain instead of having to search for accommodation after a long days hike, but if budget is an issue, then it’s definitely do-able by yourself. 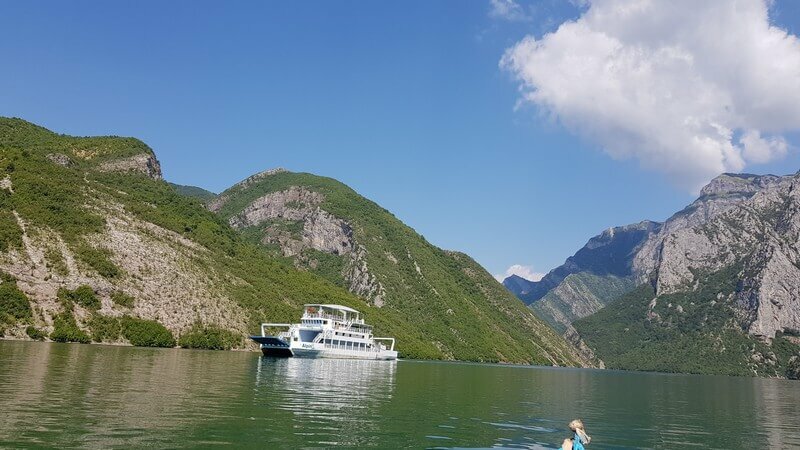 If you do plan to self-drive to Thethi then you may want to check out my fellow blogger, Sarah-Jane’s post on car hire options. Whichever way you do it, as Nike says, JUST DO IT!